Opera-the-company is still here while Opera-the-rendering-engine is no more. It clearly reminds me of the last moments of Netscape I can't help but thinking this is not a new beginning but the end of an era, and most certainly a bad omen. The Web wakes up less fragmented today but this is a sad moment because fragmentation and competition are good for innovation. Just one year ago, Opera was one of the advocates for one of the strangest decision ever requested in the CSS Working Group, the authorization for a rendering engine to implement the CSS prefix of another rendering engine. It never happened but what happened today is another magnitude, unfortunately. Oh, it's not the market share of Opera that makes the difference. Their self-acclaimed 300 million users are a drop in the ocean and are mostly related to low-end phones, still a huge market in some parts of the world. No, it's the loss of an independant innovation center. Opera engineers will discover the power of a r- you can't control... They aim at an iOS browser. Wait, based like the others on the slow html control all but Safari use? Seriously???? One CSS prefix is gone and -webkit-* increases its power. Yesterday night, I was telling Håkon Lie (Opera CTO) I could imagine him in the amazing NYC Mariott Marquis elevators looking down to Lars-Erik Bolstad (Opera VP Core Technology) on the 8th floor (at the bar with us, obviously) and saying « I am you father », Lars-Erik answering « Noooooo... ». Today, I can feel the power of the dark side of the Force. first, don't trash Presto, open its source ! > ten big players desperately currently looking for WebKit expertise. I am really sad with the loss of a good rendering engine, but I find ironic about you being notified of the news reading your iPad (please don't take this as a judgement about your device preferences). The reason we are losing Presto in the open web is because Apple is a big market and Opera can not compete there with Presto, the same way Google had to conform with a limited pseudo Chrome for iOS. This is the result Apple wants, this is about control of the web. Quite frankly, unless you are willing (like Mozilla) to build your own mobile OS, and you want to compete on the mainstream mobile market, then you can't ignore iOS and you have no choice but to use WebKit (the available parody of it at least). As for the r- problem, this will only affect them on iOS - they can (and surely will) fork for the rest, and upstream fixes eventually. Put otherwise, we are trading web engines fragmentation for webkit versions fragmentation. Not sure this is for the best. Finally, Presto never was a public "platform". 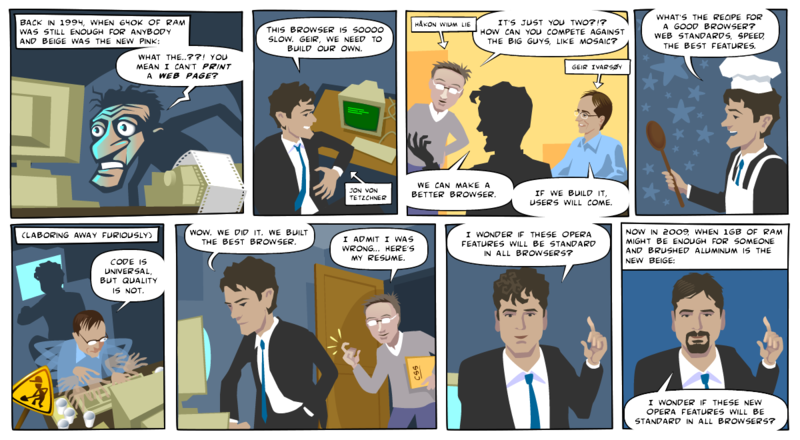 And "browsers" nowadays are becoming (for the end-user) just a convenient shell around a webview - and differences in the webview itself are rarely perceived beyond "work/doesn't work". Platforms, on the other hand, are on the rise (native app using webviews extensively) - but Presto definitely missed that train (like Gecko IMO). So why would one want to maintain an internal only "subproject", no longer differentiating your product (except when it performs badly)? But ultimately, I can't help but thinking like you, that this is not good for either standards or, ultimately, developers... at least they bet on Chromium instead of Apple WebKit (and believe me, that makes a *huge difference* - css transitions, canvas, and V8 are no subtle differences). @dmp: Just to call something to your attention, yes iOS might be a big platform, but Opera also is, iOS is around ~20% of mobile browser market, and Opera is also around ~20%. Just because people in Europe and North America don't notice it (maybe because they can afford very expensive Android/iOS smartphones while the rest of the world uses Nokia's S40 or other feature phones or smartphones in countries where mobile data is very expensive), but Opera is pretty big in Africa, Asia, South America, etc. Well in Asia it's UCWeb which is the biggest player nowadays (proxy based browser using a fork of the Webkit engine), but Opera Mini is still big too. So I don't see where they might have failed with this, as they just had a dominant place in mobile browsing, and don't see how that might be a good reason to switch just for a quite small user base of iOS devices (after all iOS market share is only around 10-15%). Something I can't understand is why everyone values so much iOS devices in western countries? Maybe because every rich person and every CEO has one? So because the boss has a Jaguar, everyone should design roads only for Jaguars? I don't get it. @bohwaz yes, you have a point - though, these 20% of "older" (or "lesser") devices are certainly a shrinking margin. Ultimately, you can't bet on low-end devices at a given time and expect that to be sustainable in the future... Moore's law. But yet again, that's a business POV I guess, not a one size fits all "truth". Also, if I read the announcement well, Opera doesn't "ditch" mini for low-end platforms - they want to keep it, but *also* provide an "upgrade" path on higher-end devices. Jaguar: are you aware it is not supported anymore, and it's all about mountain lions now? More seriously, and to try reversing your statement: what is wrong in willing to support *also* the 20% people who own the "jaguar"? @dmp: UCWeb/Opera Mini are widely used on Smartphones too, not only on feature phones but they don't have any rival on feature phones. Because mobile data is either expensive or slow. Even here in Australia 3G/4G networks are quite slow and congested, so sometimes you have to use a proxy browser to be able to load any web page. What's the joke about lions and jaguars? btw supporting the 20% people with a jaguar doesn't mean you have to ditch what you built for the other 80%. From a business perspective it's even pretty stupid: who would ditch a result of years of work, that kind of work that earned you 300 million users and a (slowly) growing market share? Opera has never been better, so I don't see the point actually, but well it's said that they're trying to sell the company, and investors always look for short term profits, not long term strategy. @dmp: Opera Mini server side software uses Presto. Opera Mobile is available on Android, Symbian and Windows Mobile. Press Release says: phones and computers. Side note: I didn't get the "power of a r- you can't control" reference, and I'm guessing a few others didn't either. Googled a bit and now I get it. So for reference's sake: "r" is a Bugzilla flag for a reviewed patch, "r+" meaning that it was accepted, "r-" that it was rejected. Sad day indeed, breaks my heart. In fact Opera is dead now. Yet another Chromium browser? What for? Your comparison to Netscape irrelevant, your other arguments are stupid. Please, be close to dev side & a bit of human. D0n't abuse news! Read this from the co-chairman of the W3C CSS group just convinces me more on how good and powerful Presto is. Opera identity is lost, but we, Opera users, are trying to make our share to keep Presto alive.